By Shondiin SilversmithIt is often thought that in order for one to experience an energetic musical performance, the band should have at least four to five band members. When it comes to Kayenta, Ariz.'s metal band, Obsolete, two sounds just as good. "Obsolete goes on stage as two, but delivers a performance that a full band gives," according to Leon Boone, 19, of his observation of fans' reactions over the past two years. "We just want to be different and we want to stand out. We put a lot of work into our band." 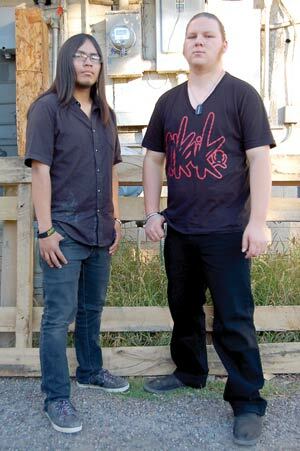 Obsolete is made up of Boone, drummer and lead vocals, and Damon Zonnie, 20, who plays guitar.Comment: For more on Navajo musicians, see Navajo Musician in The Voice and Navajo "Anime-Core" Band.